Xenon Large Hood Scoop Xenon Large Hood Scoop, Xenon 12551 Hood Scoop, Dodge Ram Hood Scoop, Dodge Dakota Hood Scoop, Dodge Durango Hood Scoop, Dodge Nitro Hood Scoop, Jeep Commander Hood Scoop, Jeep Grand Cherokee Hood Scoop, Chrysler Aspen Hood Scoop, Xenon Hood Scoop, [Xenon 12731 Hood Scoop] - $148.95 : 3rd Strike Performance, Your Source for Late Model MOPAR Performance Parts and Accessories! Committed quality, Xenon has become a leading producer of quality styling products for cars, tucks, and SUVs. The quality behind Xenon products starts with the engineering and design incorporated into each product. Xenon designs and produces all of their own tooling in house allowing them to build superior Reaction Injection Molded products. Constructed of durable urethane, Xenon products provide a blend of beauty, fit, and rugged toughness that only urethane products can provide. Xenon hood scoops are designed to provide your vehicle with a great, new look with quality built products. Each hood scoop comes ready to prep and paint allowing you to customize it to your tastes. Designed for easy installation, Xenon hood scoops install using pre-applied, automotive-grade adhesive. Measures 22" x 19-1/4" x 2"
Customize your vehicle with a quick and simple upgrade from Xenon. 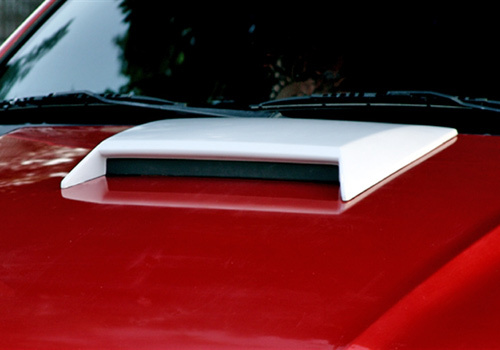 With a durable, urethane construction and unique styling, the Xenon hood scoop is a perfect addition to any vehicle.